PT.KMI (Kanzen Motor Company Indonesia) have motto "Inovasi Handal Anak Bangsa". Moto is realized with the present its new innovations, namely The First Hybrid Motorcycle in Indonesia. This achievement to the glory Kanzen. The concept is a motorcycle with the two fuels, gas and fuel. Two concepts are very fuel efficient. Because of the difficult you find gas, you can get fuel in the fuel nearby. Type in the consumption of gas can use the type of product Pertamina LPG (Liquit Petroleum Gas) the size of 3 kg. But it recommended the type of gas LGV (Liquit for Gas Vehicle), as has been shaped gas, without the need to convert the carburettor. And LGV are much cleaner. 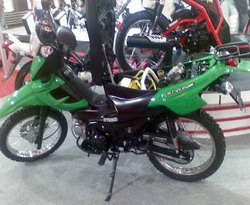 This hybrid motorcycle is also equipped APVC (Acclerated Power Consumption by Fuel), which works to pumping gas bursts of acceleration to the carburettor. Of course, this technology will improve its performance. Consumption 1 tube capable LGV through distance 240 km. "Unit ini merupakan prototype dengan menggunakan Kanzen Taurus Ultima. Ke depannya mungkin akan disempurnakan dengan detail serta nama yang berbeda." (This unit is a prototype using Kanzen Taurus Ultima. The future may be enhanced with the detail and a different name.") said from Chris Andri Tjahjono, PT.SCM Product Engineering in Raya Karawang Timur street, Km.86, Pancawati Village, Karawang, West Java. This new product will be the possibility of launching in early 2009, and likely will be launching with a price IDR, Rp.12.000.000 ~ Rp.13.000.000 (OTR). moto yang ganas ya. lihat tayar nya. huhu. I would really love if a Driving School got girls like this. Nike Free run womens sale shoes sale. Nike Free 3.0 blue womens shoes. truyen cuoi hay nhat || truyện cười tình yêu || truyện cười hay nhất|| truyen cuoi vova || truyen cuoi hay nhat || truyen cuoi hay nhat tai phan mem wechat – tai wechat ve dien thoai là chiếc điện thoại của bạn đang sở hữu một phần mềm chat tuyệt vời đó.